A Texas Rigged Worm Will Catch Bass When Your "Live" Bait is Lying Dead in the Water! Ok, here we go. Let's talk about fishing with a Texas rigged worm or lizard. I like to use worms most of the time. But sometimes when I just start the day of fishing I have a thought pop into my head. I am in the mood to experiment. I like to experiment with those ugly things in the bottom of my tackle box. Yeah, those new bass fishing lures that are supposed to be the closest thing to “live bait”. I bought a couple of those things six months ago and they are still in the package. Now if none of those work, my experimenting mood with not last. I am going to pull out the best bass fishing lure ever created. I am going to use a 6 or 8 inch plastic Texas rigged worm. And I don’t care what color it is! In the warm regions of the South, even during most of the winter, you can still fish shallow and be successful. If the weather turns real cold and the water temperature drops significantly, then the bass will move back to deeper water. Plastic worms are so versatile. They can be fished any time of the year and in any situation. A Texas rigged worm is my favorite bass fishing technique. Give me a 6” Tequila Sunrise worm, a #2 Eagle Claw worm hook and a 1/8 oz. bullet lead sinker on 12 pound test Stren line and I am good to go. This technique is easy to use. Heck, I use it so it MUST be easy! This is how you rig up the Texas rigged worm. First, cut off about 5 feet of your line, if you have been using it lately. Slip on the bullet sinker with the pointed end toward the rod. Tie on your favorite worm hook with a cinch knot. Use a new hook. Don’t use the rusty hook you found in the bottom of your boat! 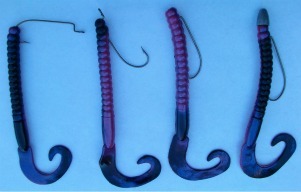 Worm hooks are either straight shank or off-set. I use the off-set because I think it makes it more difficult for the bass to pull the worm off the hook. The bullet sinker has two functions. One is to make the worm sink instead of float. Two is to sit on the knot and protect it from getting nicked during the retrieve. You have many sizes to choose from when you are using plastic worms. Worms may be anywhere from 3” to 19”. Yes, I said 19”! Check out Uptons 19” Straight Tail Worm from the Tackle Warehouse. Slide the plastic worm onto the hook and put the point inside the body of the worm. Look at the worms above. This will make the worm weedless. This way you can fish the worst underwater brush pile imaginable and still not get hung up. Some anglers leave the point of the hook slightly outside the body of the worm. 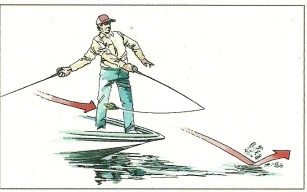 This method allows the hook to be set quicker. I always fish weedless myself. Of course if you are going to worm fish, you need a good worm rod. I would use a 6 ½ to 7 foot bait casting rod with medium action. If you are fishing from a boat, then you have many areas to fish. If you are fishing from the bank, then not so many. Early in the mornings the bass will be in the shallows feeding. When the sun gets higher and the shallow water gets too warm, then they will move into a little deeper water or under the shade of piers and structure. Use a top water bait in the morning when the water is calm and still cool. Switch to a plastic Texas rigged worm as the temp rises later in the morning. When fishing around a pier there are a couple of ways to fish it. Use a side arm motion to skip the worm as far under the pier as possible. Let the worm hit bottom. 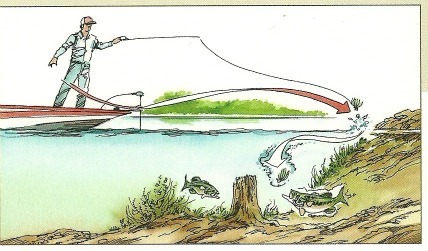 Use the rod tip to create a hopping action with the worm. Not a big hop, just enough to keep it moving out from under the pier. Or position yourself where you can cast down the length of the pier on the shady side. Cast into the shallow water and pull the worm into the deeper water using the hopping action. Stay as close to the pier as possible and be patient. If you feel the worm hitting any structure, stop your action and be still a few seconds. Mr. Bass may be staring at his dinner and about to swallow your worm. Use the Texas rigged worm under overhanging tree limbs, around stumps and any other structure where a bass can hang out in the shade. Also, if there is a line of weeds growing from the bank out into the water, hit this area all around it. Don’t get too close and cast your worm beyond the weed line and hop the worm into the weeds, through the water. And cast down both sides of the weed line. There may be stumps or other structure holding bass here. This is a prime feeding area. Be patient and be ready to get your rod just about jerked out of your hand! Now you are fishing out in deeper water around a partially submerged tree top. This situation is really what a Texas rigged worm was designed to do. Here again, position yourself to cast past the structure and retrieve the worm back along the edges. Cast the worm across the top of the structure and retrieve it back across the top and any other part of the structure. Be patient and retrieve slowly. Also try casting the worm directly into the middle of the tree top and let it sink. Using the Pitching Technique is a great way to place the worm in the middle of the structure with little splash. If you feel the worm kinda hanging up on a limb or something, then just let the worm fall back down a little bit, give it a slight jiggle, then pull it back up. The whole purpose of using a weedless Texas rigged worm is to be able to fish it almost anywhere and not get hung up. But sometimes there will be situations when you cannot get the worm free from the structure no matter what you do. That is why it is critical to check the hook tip often to make sure the tip is still inside the body of the worm! If you plan on fishing a lot of structure with a Texas rigged worm, your line is going to take a beating. It would be a good idea to use a 17 pound test line or even higher. You just hung a big bass in the middle of that tree top. What Now?? I guess the fun part of fishing a big mangled structure with a Texas rigged worm is trying to get the big mama out of there! It is critical to keep the line tight. Chances are the bass will tangle itself around the limbs and you will not be able to pull it out. Move your boat over to where you think the bass may be while still keeping your line tight. If the big mama is near the surface and making a lot of commotion, then your heart is beating out of your chest! If you are lucky, you can reach down and grab her big lip and hang on while your buddy cuts your line so you can haul her into the boat. On the other hand, if she is way down at the bottom......hmmmm good luck. It’s just the chance you take when you fish brush piles and tree tops. Here is another way to fish the Texas rigged worm. It does not matter where you are on the water. Cast out any distance and reel the worm in without it hitting bottom. Vary your speed of retrieval and lift the rod tip in short quick jerks to give the worm erratic movements. Even though you have a sinker on the line, never let the worm hit bottom. I have done this in open water when the bass were not biting anything and I was bored. Sometimes you have to shake things up a little bit. If nothing is working for a time, try using a different color worm or a different size worm. If all that does not work it may be time to go to the cabin up on the cool shady hill, eat a sandwich and take a nap!